Royal Purple is a variation of Green Fresh, in many colors and with several variations. The default variation is for blogs and works on all screen widths from 1024 pixels and up. It's iPhone compatible and fixed to 950px wide so that your layouts are predictable. The wide variation is ideal when you need all the screen space you can get for your project. It grabs 90% of the screen width, up to 1200 pixels wide. To make hover popups around images or text, use this syntax: Image or linkHover text. 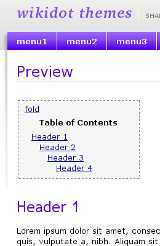 See an example and the original HowTo. and with help from many others. You can create your own customizations of this theme quite easily in your site manager. 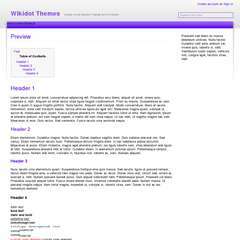 Create a custom theme and use the wide variation below code as a starting point. Then, add your customizations. You can change the color set simply by changing the @import line. Please use the Wikidot Forum to discuss this theme and get news about updates. You can also Watch this page to get an email when it changes. Basado en un diseño de Gabrys. y con la ayuda de muchos otros.
? ? ? What do you want ?? ? a Translation? is this helpfull?